Do you want to train for a Strongman contest? Or, do you simply like Strongman, but not sure how to train due to a lack of equipment access? This E-book will guide you through how to structure a Strongman training program that can be done in any gym with even the most basic of equipment, and includes a 12 week program. Necessary equipment to follow the program? Basic equipment such as barbells, weights, dumbbells, and maybe a few machines. This book is intended to help people that train in commercial gyms, garage gyms, functional fitness gyms and more. Do you sell hard copies? No this is an E-book (digital download) you will have to read it on your laptop, E-reader, tablet, smart phone or print it out. A clear and methodical breakdown of the elements involved in strongman training, which greatly simplifies how to train for what can feel like a bewilderingly broad range of events. Extra helpful for myself as an over 40 MMA enthusiast, who wants straightforward yet comprehensive workouts. My husband and I have been doing this program for about 6 weeks and are both seeing a tremendous difference in our strength and endurance. The program totally suits our style and we will continue with StartingStrongman guidance/literature for the foreseeable future! Thanks soooo much!!! Great read and really good information! This book is perfect for beginners of Strongman training. This e-book is extremely informative! It guides you through strict translations from Strongman exercises to traditional gym exercises. It would be foolish not to have it, especially at the price! Great value all the way! I bought this book. I’m a complete novice to strongman and needed a starting place. This book lays out the foundation to start from. Form what excersises help with each lift to a program in the back which will give you a run for your money. Anybody starting out should buy it. Kalle is very knowledgeable and have recommended his book several times. This guide was exactly what I was looking for. I currently lift in college gyms right, and they are not equipped at all for Strongman training. For this reason, it can be very difficult to work on variations/techniques that Strongman relies heavily upon. This guide is clever and easy to understand. After seeing some of the example manipulations for equipment – such as setting up the Viking Press – it felt as if I should have figured it out myself before! No offense taken, nor meant. All I mean to say is that I was perhaps making things far harder than they needed to be (or at least holding to the ideal that I needed more equipment than I actually do). I did not follow the 12-week program given by itself. I combined it’s principles (Horizontal Push/Pull, Vertical Push/Pull days, e.t.c.) with Brian Alsruhe’s Power-Building program. That said, I found the program to be succinct and quality. Though I am not a current competitor in Strongman, or Powerlifting, I do not believe the program would be too burdensome to a newcomer to lifting. Simple and effective. I am very satisfied with this guide. Getting it on sale was a true boon. Thank you, Kalle, for making my entry into Strongman a little easier! Very informative and helpful for people without regular access to strongman implements. It gives you a good understanding of the main and accessory lifts which help contribute to and build up the main strongman events. 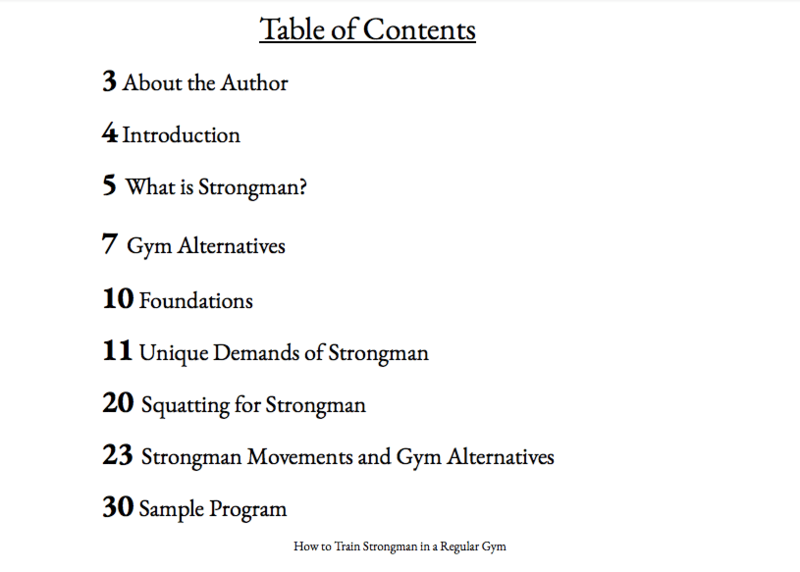 Program included at the end is well-designed and basic enough for a completely new strongman lifter to follow. Yes you could probably find most of this information online but it’s nice to have it conveniently organized in one place and supporting this site helps support our niche sport.